I rarely get sick, but when I do, I whip up a batch of Chickpea Noodle Soup from Veganomicon and I’m better within a few hours. Seriously. I’m not sure if its the miso, spices, broth or a combination of all the ingredients, but this soup will cure what ails you. 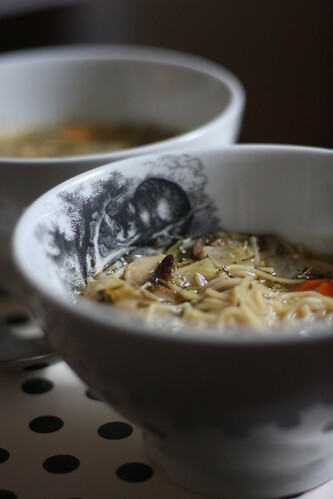 But unlike cough syrup or other icky-tasting medicine, this soup tastes fantastic and will warm you from the inside out. The original recipe calls for a brown rice miso, but I’ve found that a chickpea, white or mellow miso tastes nice too. This recipe is adapted from the Vcon version. Saute the pressed tofu in 2 TB of the oil until browned in a large stock pot over medium high heat. Remove and set aside. Add in the rest of the oil and add the carrots and onions and saute for 10 minutes. Add the garlic, mushrooms and herbs and sautee for 5 minutes more. Deglaze the pot with the mirin or wine and then add the stock and chickpeas. Cover and bring to a boil, then reduce the heat to medium low. Simmer for 10 minutes. Add in the capellini and cover again. Cook for 5 minutes and then remove the lid. In a small bowl, combine the miso with a bit of the broth until its well combined, then add that back into the pot. Add in the sauteed tofu and incorporate well into the soup. Once you’ve added in the miso, don’t boil the soup—it will destroy all of the beneficial enzymes in the miso. Enjoy! I have to make this soup soon. It looks so frickin' good!